Mission: The Austin Junior Forum is a non-profit volunteer organization supporting women, children, and the elderly in the Austin area through community service and fund raising. 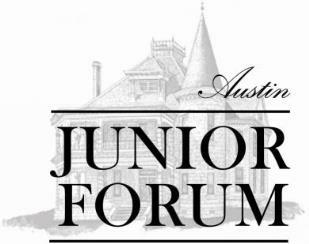 Austin Junior Forum serves the community in many different ways from hands-on community service to raising funds and providing grants to other non-profits in our Austin community. We work with several local organizations serving the community, as well as hosting some community service projects of our own, including our Teddy Bear Program, which provides stuffed Teddy Bears and Dalmatians for local public safety agencies to give to children involved in traumatic events, and Caswell House Etiquette Classes, offering the children and youth of central Texas an opportunity to develop and polish their interpersonal skills. The members of AJF also provide approximately 11,000 volunteer hours each year to selected community organizations. For more information on our community service projects and the organizations with which we work, please visit our Community Service page. AJF’s annual fundraiser, Christmas at the Caswell House, raises funds that are distributed to other local area non-profits through our Grants Program. The historic Daniel H. Caswell House is transformed into a winter wonderland for the holiday season and open for viewing during the first part of November. The house is filled with holiday merchandise including Christmas ornaments and holiday décor, fabulous jewelry and clothing, affordable gifts, and a wonderful gourmet bake shop. Funds are also raised through ticket sales to classic Austin holiday events such as our Daily Tearoom Luncheons, Mother-Daughter Tea, Candlelight Supper, Gospel Brunch, and other special holiday events. Since the inception of the Grants Program in 1983, AJF has contributed more than $1.3 million dollars towards causes benefiting women, children, and the elderly in the Austin community. For more information on our grant recipients, please visit our Grants page. Austin Junior Forum is also the proud owner of the historic Daniel H. Caswell House. This beautiful Victorian home was built at the turn of the 20th Century and was purchased and restored by the ladies of Austin Junior Forum in 1979. It was opened to the public in 1983 as a venue for weddings and events as well as a center for community service. The Daniel H. Caswell House is listed on the National Register of Historic Places and is a Texas Historic Landmark. AJF is sales tax exempt under Sec. 151.310, Texas Tax Code. AJF also has a 501(C)(3) designation under the IRS Code. Tax return information is available through GuideStar.org.